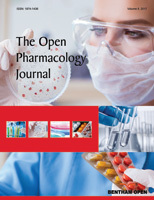 The Open Pharmacology Journal is an Open Access online journal, which publishes research articles, reviews, letters and guest edited single topic issues in all important areas of pharmacology, drug mechanism of action, pharmacodynamics, pharmacogenetics and toxicology, computational biopharmaceutics, drug delivery and targeting, molecular biopharmaceutics and drug disposition, pharmacokinetics, biochemical pharmacology, and pharmacodynamics. The journal also covers special reviews, commentaries, and case reports on all aspects of experimental and clinical pharmacology. The Open Pharmacology Journal, a peer-reviewed journal, is an important and reliable source of current information on important recent developments in the field. The emphasis will be on publishing quality papers rapidly and making them freely available to researchers worldwide.